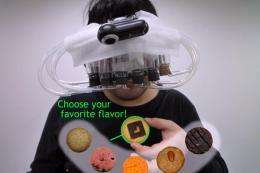 (PhysOrg.com) -- Can you fool the human sense of taste in the world of virtual reality? Up until recently that question was impossible to answer, most because it had not been tested. Most of virtual reality relied on sight and sound. Virtual touch is also a fairly new area of research. Now, with the help of your nose, virtual taste may be on the way. A virtual reality system, created by a team of researchers at the University of Tokyo, is helping to change that. The system works with smell and sight, to try and manipulate users perceptions of the taste of a cookie. The system works like this. Users are hooked into the system and given a plain cookie. They are then shown an image of one type of cookie and they are exposed to the scent as well. There were seven scent-filled plastic bottles for the researchers to choose from in the testing. Then they are asked to eat the cookie, and tell researchers what type of cookie it is. Thus far, the system has been able to fool people with a fair degree of reliability. This system, which is being called the Meta Cookie, does have one serious advantage, its texture. Since the users are eating a cookie with no flavor, the food feels like a cookie when users eat it. The system not be able to convince users that they are eating a cookie if they were being served pudding in its place. While this technology is undeniably cool, there is no word on potential commercial applications for the scent based virtual reality system in the future.